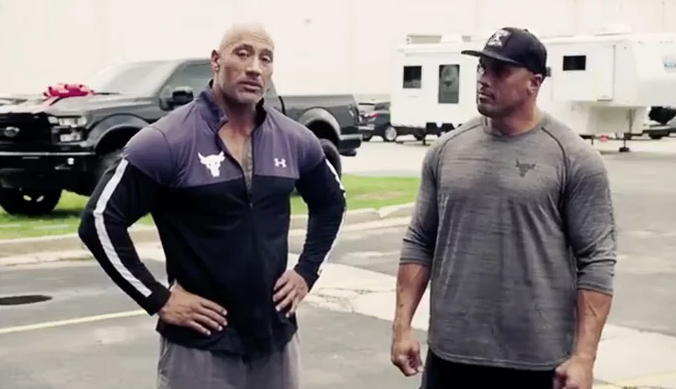 Dwayne Johnson Surprises His Longtime Stunt Double With A Brand New Truck, Watch The Heartwarming Video Inside! - T.V.S.T. Dwayne Johnson Surprises His Longtime Stunt Double With A Brand New Truck, Watch The Heartwarming Video Inside! Whaaat? We finally have a story that will make you smile instead of roll your eyes? Yeah, we’re shocked too. Apparently, there are still some decent people out in Hollywood, and Dwayne Johnson is one of those decent people. The 46-year-old movie star surprised his stunt double (who also happens to be his cousin) with a custom truck for all his years of hard work. His cousin, Tanoai Reed, had just returned to work after an injury and thought he and Johnson were simply filming a behind-the-scenes clip for the movie. The first time they worked together was in 2002 for The Scorpion King, and since then, he has doubled for Johnson in at least 20 films, including Jumanji, Rampage and The Fate of the Furious. Well, damn. Now a truck doesn’t seem like enough. GIVE THIS MAN A HOUSE! GIVE THIS MAN A PROPERTY ON MARS! The Insane Story Of How The McDonald's Monopoly Game Was Rigged By An Ex-Cop For 12 Years!